I love Darn Good Yarn so much, and while I was buying yarn for my purse, I saw the chiffon rainbow pack, which was unfortunately sold out. I knew right then that I wanted a rainbow shawl made from that yarn. Darn Good Yarn is a pretty amazing company. Owned by a US veteran, selling fair trade yarn made from recycled goods, in incredibly bright, beautiful colors, a winner in every way. 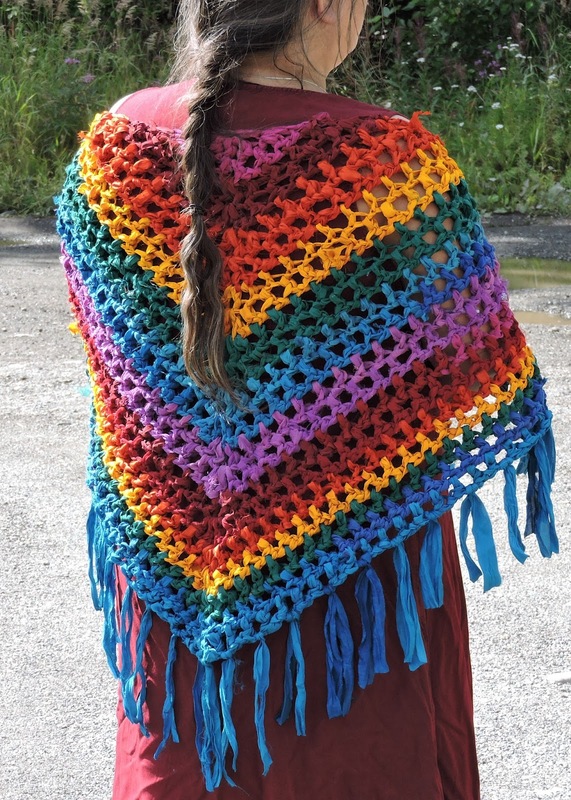 To make this shawl, I ordered 2 rainbow packs of chiffon ribbon yarn from Darn Good Yarn. 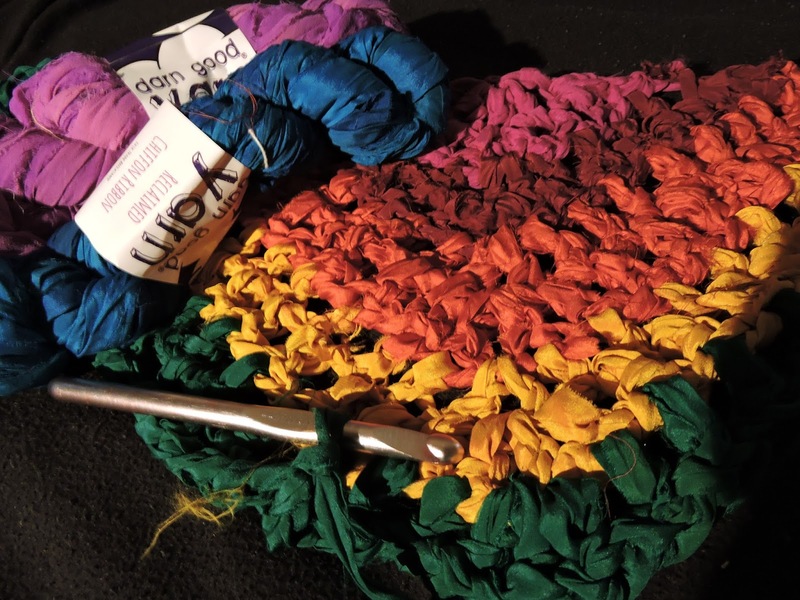 The ribbon packs come in different colors, so you don't have to make a rainbow shawl. Pick your favorite color packs. I just really like rainbows. The packs have 4 skeins each. The shawl works up very quickly. It took me 2 evenings to finish it. In the end, I used 7 skeins, and had about half a skein left of the orange and yellow. Because of the nature of the ribbon packs, your colors may vary from mine, so you'll adapt the colors of the rows to fit the colors you get. Arrange your rainbow so color 6 is one you have two skeins. Some quick notes- because of the nature of the yarn, to change colors, I just tied square knots in the yarn and kept working, working the ends in as I went. That made it go fast, and it works because there are knots and loose ends from stitched together ends as well in the ribbon. It adds to the texture and makes it super easy. When you're winding the center pull balls, make them loose and easy. Keep a pair of scissors handy to trim loose threads. Now it's all the same pattern. All the rows start with Ch 4 (counts as first dc and ch 1), dc in same stitch, ch 1, dc in next stitch, until the center loop of the previous row, ch 1, dc in loop, ch 1, dc in loop, continue ch 1, dc in next stitch to the last stitch of the previous row, dc in stitch, ch 1, dc in stitch. So the increases are worked in the first and last stitch of the previous row and in the center. Fringe- Cut 43 pieces of ribbon 10 inches long. Pull loop of ribbon through first space, pull ends through loop and tighten, skip next space, put fringe in next space all the way around.